Legendary artist Herb Trimpe (The Incredible Hulk) joins regular B.P.R.D. 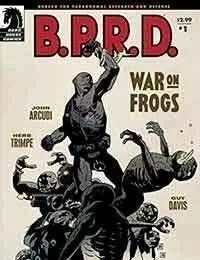 writer John Arcudi and Hellboy creator Mike Mignola for the first of four one-shots set before the events of B.P.R.D. : The Black Flame, chronicling the Bureau for Paranormal Research and Defenses fight against the frog monsters. As the frog cult spreads across America, Roger the Homunculus returns to the site of the B.P.R.D.s first clash with the frog creaturesthe ruins of Cavendish Hall, where Hellboy, Abe, and Liz first encountered both the frogs and Rasputin (Hellboy: Seed of Destruction)to track down the final pieces of the puzzle of the Cavendish family. **Cavendish family puzzle solved!